Absolute security is unobtainable. Disasters will strike, violent extremists will attack, and our systems, infrastructure and planning will not always stop every threat. The challenge for the United States is to create resilient systems and communities, so when a bad day arrives, the damage is limited and the recovery is rapid. This emphasis on building resilience is often missed in the general public awareness of the Department of Homeland Security, which sometimes assumes DHS’ mission begins and ends with TSA airport screening. In truth, there are legions of individuals in the Department striving to enhance our national readiness and resilience. One of these people is Ehsan Zaffar, who works at the intersection of security and civil rights, helping to ensure DHS continues to secure the nation without violating individual civil liberties. Security Debrief spoke with Zaffar to better understand how the Department draws in professionals from diverse fields to better achieve the DHS mission. In his case, Zaffar is a practicing lawyer from California, where he worked with low-income communities in crisis. Before DHS, Zaffar founded the Los Angeles Mobile Legal Aid Clinic and also worked to provide legal assistance to communities in Louisiana in the aftermath of Hurricane Katrina. And Zaffar has served as a mediator, working to help resolve intractable disputes over difficult issues between and among diverse communities, such as faith-based groups. It’s an unlikely background for a man who now serves as a Senior Advisor at the DHS Office for Civil Rights and Civil Liberties. Today, Zaffar leads DHS’ efforts to implement United Nations Human Rights Council Resolution 16/18 on “Combating intolerance, negative stereotyping and stigmatization of, and discrimination, incitement to violence, and violence against persons based on religion or belief.” This work takes Zaffar to communities around the nation and to countries around the world, where he speaks, teaches, and learns about building community resilience and supporting religious freedom and human rights. 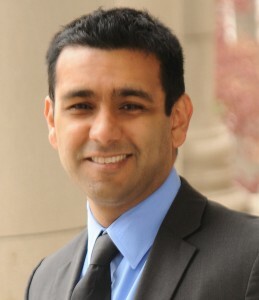 A graduate of the Pepperdine University School of Law, with a certificate in Dispute Resolution from the Straus Institute, Zaffar now teaches courses on civil rights and national security at George Washington University, John Marshall Law School and at other universities, helping cultivate the next generation of leaders. Too often, homeland security is a thankless endeavor. But Zaffar, like thousands of other DHS employees who toil without much recognition, is not concerned with thanks. While his roles have changed over the years, his singular motivation remains the empowerment and advancement of citizens throughout the country. Do you know an unsung hero at the Department who deserves some recognition? Share your stories with us and help shine a light on all the important work being done at DHS that is seldom acknowledged.